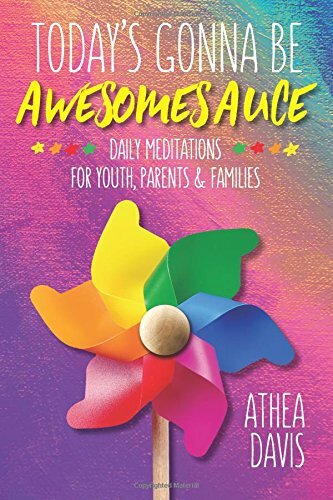 Today’s Gonna Be Awesomesauce is a daily mindfulness meditation book for youth, parents, and families (and educators too!) filled with practical wisdom, quirky wit. It was created with an edgy savviness through an educator’s lens, a yogi mom’s heart, and a superhero love for humanity. Let the words clear your mind and dance in your heart space. What will you find in this book? – 365 mindful breathing mantras – Tools to help you turn grief (including our daily roadblocks) into rainbows – Tools to help you spark your creative power to practice focus and sustained concentration – Learn how to identify and self-regulate our emotions – You’ll commit time to self-inquiry to gain better awareness about ourselves, how we relate to others and our environment Today’s Gonna be Awesomesauce takes readers below the surface to tap into a limitless reservoir of the special sauce, Awesomesauce, which feeds all that stuff on the outside to bring authentic transformation to how we relate in and to life. The 365 mindful breathing mantras are for days when you are short on time and can’t read the day’s entry. The book has something for everyone in the family and it’s great for educators too. Whether you read an entry a day or read a few, you will notice a shift in your heart and mind space. In that shift, you will feel deep inside that Today’s Gonna Be Awesomesauce!